Bobbi Daniels owns Raven Frog Fibers in Sitka. Raven Frog produces hand spun and hand dyed yarns that are carried in yarn shops all over Alaska and throughout the lower 48. Bobbi Daniels designs fascinating patterns for the yarn line and teaches various levels of spinning and knitting workshops wherever Raven Frog yarns are carried. Raven Frog employs spinners in Sitka and other southeast Alaska communities who produce the handspun yarns working from their homes, providing income opportunities in remote and chronically under-employed areas. Bobbi Daniels has been interested in fiber and textiles all her life, learning first to sew from her mother and grandmother and later picking up spinning, knitting and weaving. She has taught spinning and knitting for 15 years and before moving to Alaska owned a fiber arts retail store in Utah stocking knitting machines, spinning and weaving equipment and supplies. Bobbi Daniels professional background is in broadcasting and marketing. She came with her two young sons to Alaska in 1998 as the general manager of Sitka’s two commercial radio stations. 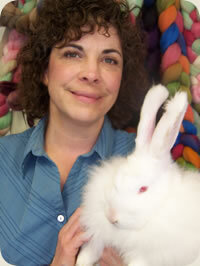 Her fiber hobby came with her, most notably in the form of the angora rabbits they transported with them on the ferry to Alaska. Bobbi indulges her love of the microphone by driving tours for cruise ship passengers during the summers in Sitka. Bobbi started spinning and dying her own yarns and knitting friends began buying the handspun yarns she produced and she put her yarns in the summer fund raising sale operated by a local arts and crafts association. The sale is frequented by cruise ship passengers who would purchase Daniels’ yarns in Sitka then carry them into yarn shops in other ports looking for more. The shops contacted Daniels to supply them with yarns and Raven Frog Fibers was born. Today the business encompasses an 1800 square foot production facility with an on-site staff of three and eight additional employees who spin from their homes. Raven Frog had never been able to meet the wholesale demand for handspun yarns and there are chronically high unemployment levels in many remote southeast Alaska villages, so Daniels proposed that she teach spinning and supply wheels to under employed and unemployed people in southeast Alaska villages, allowing them to earn an income from their homes and supplying handspun yarn for Raven Frog. Bobbi Daniels has been teaching fiber related courses for 15 years, including spinning, knitting, fiber dyeing and felting. She currently does a lot of design work creating new patterns for the Raven Frog line of yarns. Daniels has published over 50 original design patterns for Raven Frog yarns which are available at the retail yarn shops where Raven Frog yarns are sold and online. Because living on an island in Alaska restricts the access to the industry’s top instructors and designers, Daniels reads all the trade books and publications she can get her hands on to stay abreast of where the industry and knitwear fashion world are headed next. Awards include 2007 Recipient of Alaska Marketplace Award of $35,000 to travel to southeast Alaska villages, teach spinning and supply wheels to employ spinners to work from their homes. Bobbi Daniels has a B.A. degree in broadcast communications and Spanish from De Pauw University in Indiana and did her M.A. coursework in foreign language pedagogy at Brigham Young University in Provo, UT where she also taught undergraduate Spanish.